Every Sunday morning before church, my whole family would gather together at my grandparents and have breakfast. My grandmother made the biggest breakfast spread that you can imagine. One thing that was always on the menu besides the normal sausage gravy, was chocolate gravy. I know a lot of northerners never have heard of this dish before, so maybe it’s a southern thing. All I know is that it is very delicious! I had been craving this for the past few weeks, but have been hesitant to make it because it is very rich. Mind you, it’s not like having a chocolate bar by any means, but it is definitely sweet and indulgent. I would like to also state that this is not something that you should have every week, but rather something you should treat yourself to once in a while. I think I average having it twice a year, sometimes three times. It all depends on if my son visits me or not. He loves chocolate gravy almost as much as me! I finally gave into my cravings, and decided to make it this morning. After all, I did have a very active weekend and I figured what the hell! 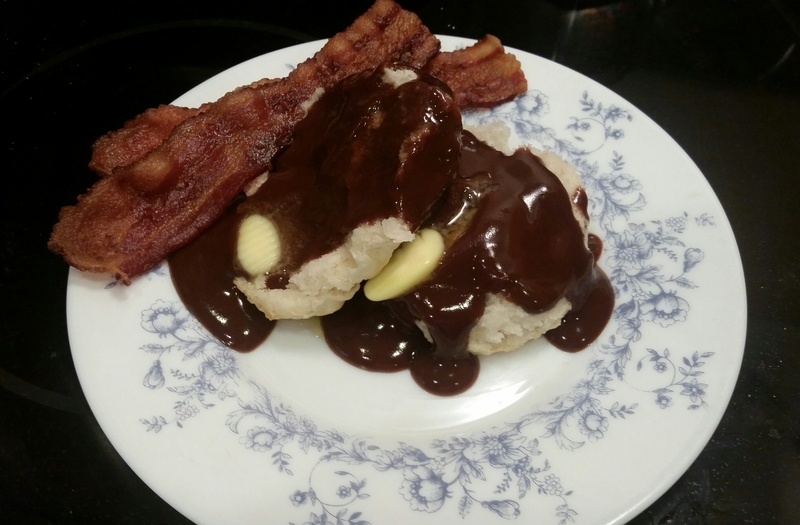 If you like the combination of sweet and salty, then you will love having a couple slices of bacon with the chocolate gravy, served over a hot biscuit! Whisk the cocoa, flour, salt, and sugar together in a bowl until there are no lumps. Bring the water to a slow boil. Once the water is boiling, gradually add in the dry ingredients whisking quickly until its consistency is similar to gravy, 7 to 10 minutes. Remove from heat. Serve immediately with biscuits, butter, and a side of bacon.